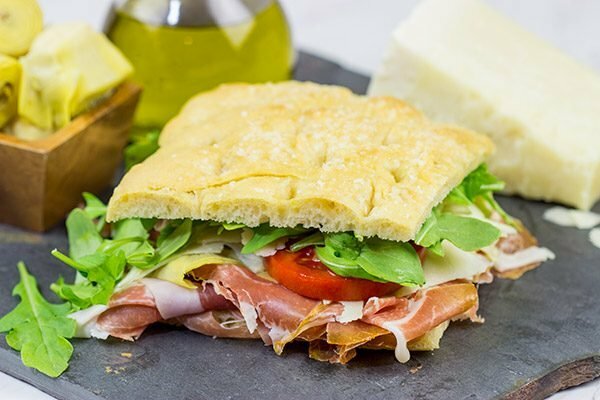 These Italian Prosciutto Panini start with a classic Tuscan bread called schiacciata. Add in some Prosciutto di Parma PDO, marinated artichokes and Pecorino Romano PDO, and you’ve got a delicious sandwich! Years ago, Laura and I briefly entertained the idea of opening a sandwich cafe. Over the years, we’ve talked about how it would be a fun adventure, but we’ve chosen to go other directions…at least for now. Let me set the stage here, though. We were in Italy on our honeymoon, and we were spending a couple of nights on the island of Capri. If you’ve never been to Capri, then put it on your bucket list. Seriously! It’s one of the most stunning places I’ve ever visited, and we definitely have plans to go back. It was around lunchtime, and Laura and I were getting a bit hungry. We were craving a good sandwich, and we found a small grocery store with a deli counter in the back. A chalkboard menu behind the counter advertised 2-3 different sandwich options. That’s it. Nothing crazy at all. Just a few simple ingredients…but the key was that the ingredients were all top quality. We enjoyed those sandwiches while sitting on a bench overlooking the stunningly blue water of the Gulf of Naples. The gorgeous setting plus the incredibly delicious sandwiches made for one memorable lunch. Fast forward 7 years, and Laura and I found ourselves back in Italy earlier this year. Our itinerary this time didn’t include Capri, but that didn’t stop us from finding the most epic sandwich shop of all time! 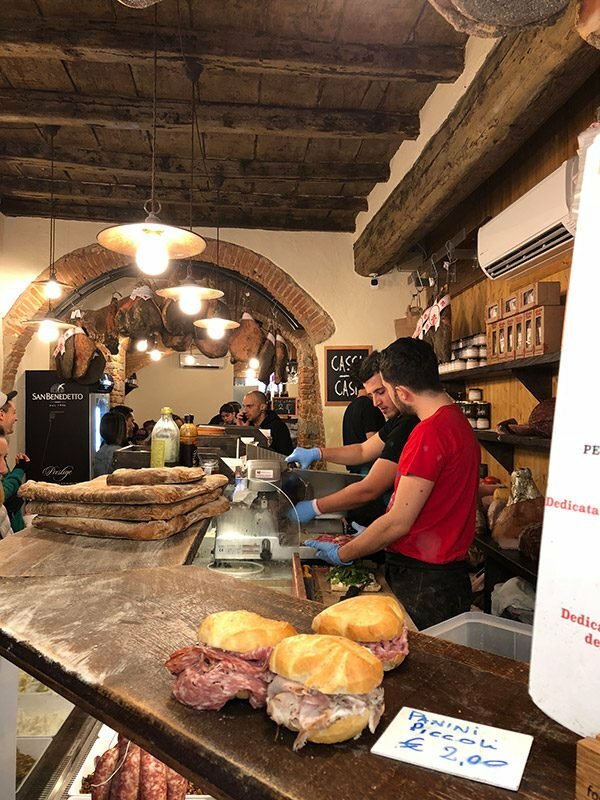 Located in the shadows of the Galleria dell’Accademia (home to Michelangelo’s David) in Florence is a small sandwich shop called All’Antico Vinaio. When traveling, we typically avoid restaurants located near tourist attractions. Instead, we wander a few blocks off on the side streets and look for the places where the locals eat. But All’Antico Vinaio is different. It’s currently the #3 most reviewed restaurant in the world on TripAdvisor. Yes, the world! We knew we had to see what the fuss was about. Calling All’Antico Vinaio a sandwich shop is a bit of a misnomer. It’s really just a window, and the lines form down the street. Long lines. Really long lines. But the lines move quickly, and the wait is worth it! The sandwiches reminded me of the ones we ate in Capri. Simple, but using the best ingredients possible. Oh, and these sandwiches were as big as our face. Seriously! We each ordered a sandwich, and I’m proud to say that I finished mine. I had to take a small break, but I did it. When you’re talking about that kind of deliciousness, I can’t help but finish it! Inspired by those sandwiches and our trip to Florence, I decided to come back and try my head at making a homemade version. After some research, I learned that the type of bread is called Schiacciata, or Tuscan flat bread. 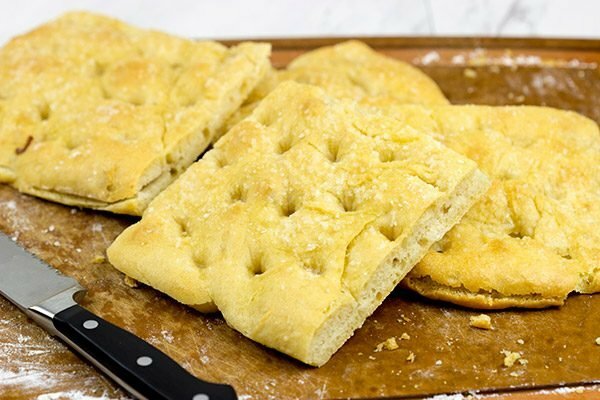 It reminds me of a very thin focaccia-style bread, and you simply slice it in half to create the bread for your sandwich. 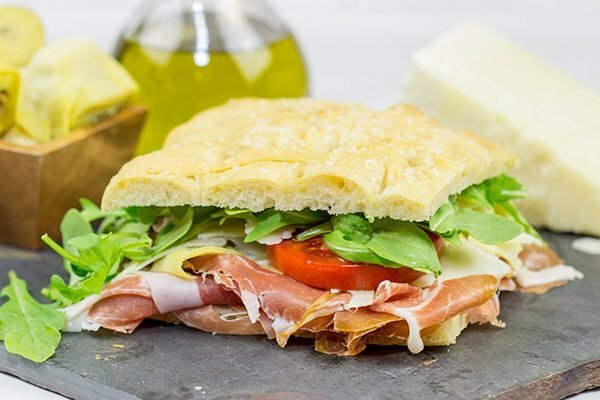 From there, you just tap into your inner creativity and create a delicious sandwich using authentic Italian ingredients. Fortunately for us, it’s becoming much easier to find authentic Italian ingredients here in the United States. For these Italian Prosciutto Panini, I stopped by a local store here in town and picked up some Prosciutto di Parma PDO, Pecorino Romano PDO and marinated artichokes. 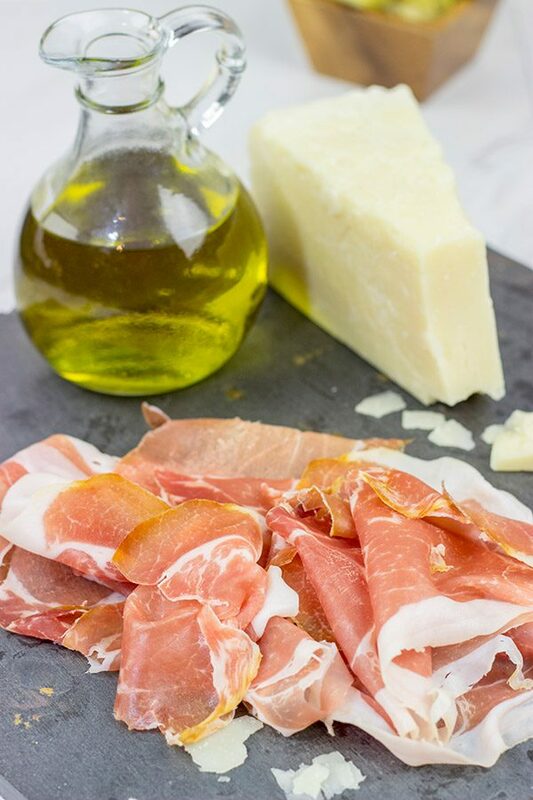 Prosciutto di Parma PDO and Pecorino Romano PDO are both designated with PDO (Protected Designation of Origin). As I mentioned in the post earlier this week for Tuscan White Beans, PDO is a set of laws that protect foods produced in certain regions. When shopping for Italian ingredients, I always look for the PDO stamp or label. That label is proof that the item was produced in the specified region in Italy. For instance, Prosciutto di Parma PDO is produced according to exact specifications in the Italian province of Parma. (Parma is where Parmesan cheese gets its name, too.) And the Pecorino Romano PDO must be produced from pasture-grazing herds of sheep raised in the wild, and the cheese must be produced in Lazio, Sardinia, Tuscany or the province of Grosseto in Tuscany. That PDO symbol is how you know it’s an authentic Italian ingredient! 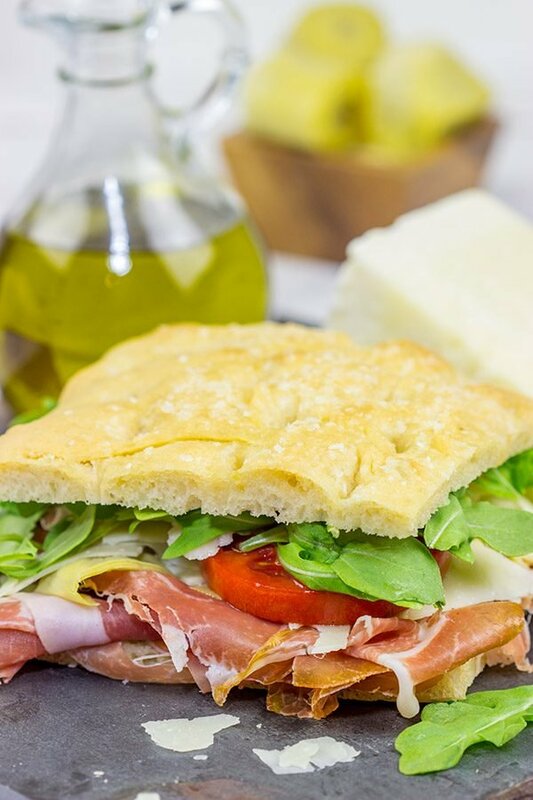 When creating simple recipes like these Italian Prosciutto Panini, it’s important to use top quality ingredients. I made sure to ask about the PDO designation at the deli counter, and I looked for that PDO stamp on the wedge of cheese. Click here to discover more about DOP labels and a whole variety of authentic Italian ingredients! 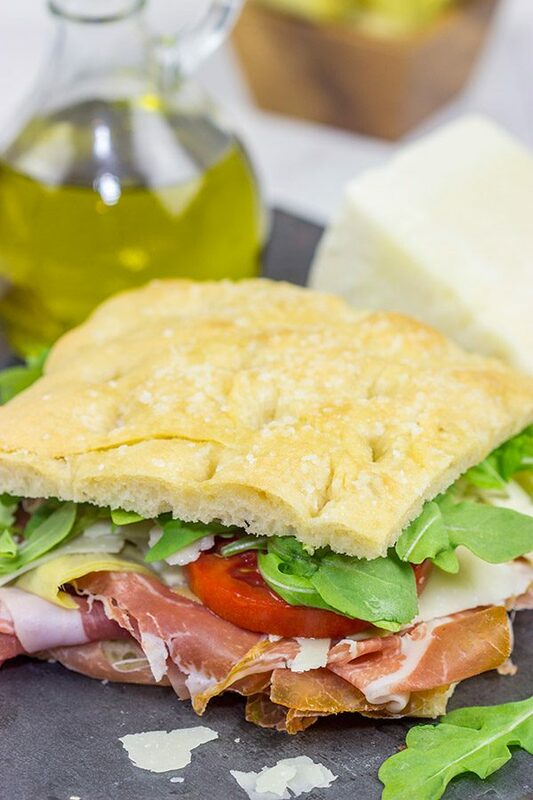 If you’re in the mood for a tasty sandwich, keep these Italian Prosciutto Panini in mind! 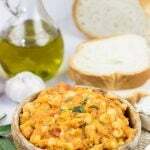 Aside from making the bread, this is a simple recipe…but the flavor will whisk you straight away to Italy! Cheers, friends! Using a countertop mixer with dough hook attachment, add flour, yeast and warm water. Mix on low speed until dough comes together. Increase speed to medium and continue mixing for 3-4 minutes. Brush 1 Tbsp of olive oil inside a large bowl. Turn dough out into bowl and flip dough so that it is coated with oil. Cover bowl lightly with plastic wrap and place in a warm location until dough has doubled in size (~60 minutes). Brush center portion of a sheet pan with another 1 Tbsp of olive oil; set pan aside. Turn dough out onto floured countertop and fold several times. Shape dough into an 11” square. Place dough on prepared baking sheet and cover lightly with plastic wrap. Place in a warm location until dough doubled in size (~30 minutes). Press fingertips firmly into top of dough to create indentations. Brush top of dough with remaining 2 Tbsp of olive oil. Sprinkle kosher salt evenly across top of dough. Bake for 28-30 minutes, or until bread is light golden brown in color. Let bread cool completely before slicing. Slice the bread into 4 smaller squares; set 3 of the pieces aside for future sandwiches. Working with remaining square, slice in half to create 2 “slices” of bread. Starting with the bottom half of the bread, layer all of the panini ingredients (salami, pecorino, artichokes, tomato and arugula) on top. Top with remaining slice of bread. Look for a young (not aged) Pecorino Romano PDO cheese. Young pecorino is softer making it the perfect cheese for a sandwich. If you use an aged version, simply shave several pieces into the sandwich using a vegetable peeler. I had to google what the top two most reviewed restaurants in the world are. . .and I came across TripAdvisors top 10 and now I’m starving. And I’m also planning to work my way down the list at some point in my life :). This sandwich sounds awesome and I’m totally living vicariously through your trip. Italy is my favorite country! Have a great weekend! Tell me about it, Kelsie! I got sidetracked looking at that top 10 list, too. So many good eats! Trouble is they are spread across the world. Hmmm. Guess we just need to stop and travel the world, eh? 🙂 Italy really is my favorite vacation spot. I’m pretty sure I could just move to a villa in Tuscany (near a winery preferably) and be a quite happy camper! I’ll confess, as I’m reading this my inner voice was chanting, “Please give the bread recipe. Please give the bread recipe.” 🙂 Like a muffuletta, it’s all about that bread. Oh this Panini looks awesome!!! Thank you so much, Sheenam! 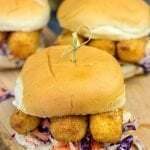 It’s all about the delicious ingredients as the sandwich is pretty darned easy to make. 🙂 I appreciate you stopping by and commenting! I love sandwiches like this and should make them more often. Capri is on my bucket list. 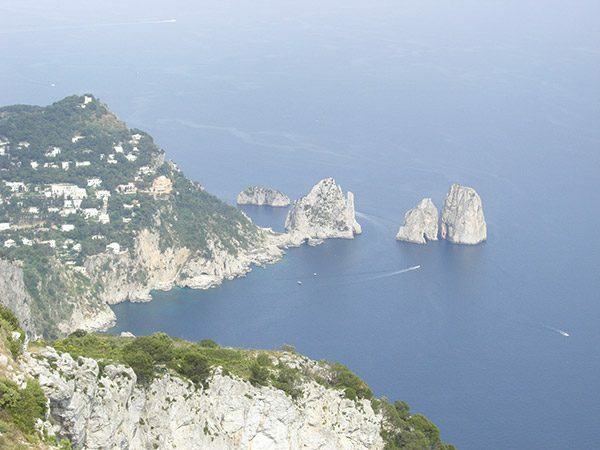 Definitely keep Capri on your bucket list, Gerlinde! In fact, bump it up a few spots. It’s one of the most gorgeous places I’ve ever visited! And make sure to get a delicious sandwich and sit on the bench looking out over the water. That memory is one of my favorites! 🙂 Thanks so much, my friend! 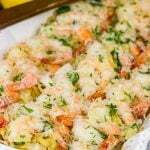 Hey David…I also read your post and this is one of my favorite recipe till now. 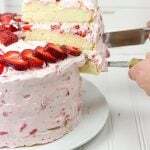 this looks soooo good & more delicious…Thanks for sharing……….! Thank you so much, Madison! I don’t know, David. I’m pretty sure Parmesan cheese comes from Parma Ohio, and that PDO stands for “pretty darn Ohioan.” “Schiacciata” is merely what they think sriracha is called in Cleveland. So, maybe you and Laura ought to reconsider these highfalutin trips you’re taking overseas and make a pilgrimage to the Midwest one of these days. HAH! You might be onto something here, Jeff. We all thought Parmesan was from Italy, but really Parma, Ohio has been pulling the strings for years. 🙂 (I’ve never even heard of Parma, Ohio, by the way…) But you’re right…we do need to come midwest soon. Thanks, buddy! You know, I’ve gotta say that this sandwich was surprisingly close to the ones we remembered from our vacation. I mean there’s nothing crazy about it…just downright good ingredients. 🙂 Thanks so much, Kathy! As you so correctly point out, there’s nothing better than a panini made with the best ingredients. 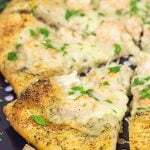 Schiacciata is a wonderful flat bread and one that can be used in many types of dishes, even dessert. But, in my mind, it makes the best panini bar none. 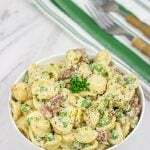 Easy to make and yummy to taste. That’s one good looking sandwich. Schiacciata for dessert, eh? That sounds interesting! This was my first foray into making schiacciata at home, and I found it surprisingly easy…and delicious, too! Thanks so much, Ron! I love good sandwiches. This one sounds like it great. I would love to go to Italy someday. Sounds like you have had some great vacations. What a delicious sandwich David. And after reading your post and recommendation to put Capri on our bucket list I’ve done just that! And a return trip to Florence!! Lil S and I have been talking about heading back to Italy and your post is making me yearn for it more than ever! Next time we are there, Capri is on our list. Y’all sandwich in Capri reminds me of our little meal (or rather meals) of crusty bread and olive tapanade of sorts from a store and Limoncello over frozen yogurt – one of the next meals ever cos everything was so fresh and we were in Sorrento! But back to this sandwich, wow, what a masterpiece! I am all for you revisiting the idea of opening up a sandwich shop – lil S and I will definitely fly up there for opening day! And thanks for the tip on “PDO”! Happy Wednesday my friend! Sandwich sounds and looks very yummy. Sammies you and Laura had on vacation sound Awesome, WTG for finishing yours. I can see why you came home and came up with this recipe. BTW thanks for adding bread recipe, we do not have an Italian bakery around here. Sounds easy enough that I could make it – bread has always been a challenge for me. I have never noticed PDO on any of my Italian cheeses or Prosciutto, so not sure if we get PDO ingredients around here, but will look in future for that PDO. Let me know if we are suppose to be putting salami and prosciutto on sammie, or just prosciutto – thanks !!!! Yes! A good PLT just needs to happen. And, yes, you totally caught a mistake in the recipe there, Mar. I originally set out to make a salami version of this sandwich, but the Prosciutto just looked so good that I called an audible and made the chance. I’ve fixed the recipe. Thanks so much for catching that one! And honestly, you could totally use salami here. Or even a mix of salami and Prosciutto…whatever you’d like! Do keep an eye out for the PDO label, too. It’s a surefire way of knowing you’ve got the authentic Italian ingredients! I Def will give the bread a try, we went out with friends tonight and I had chicken salad on ciabatta bread very yummy. Have a super weekend !!! I hope you all are having a nice w/e !! Still not seeing any PDO products in our local grocery stores 🙁 I shall keep looking though. Awesome! 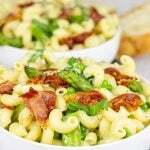 That prosciutto + pea pasta salad was really fun, and I hope you enjoy it as much as we do. And definitely make PLT’s for lunch one day this week. Perhaps today? 🙂 So PDO products are out there for sure…keep looking. Chances are you’ll recognize them by the label or the stamp on the label rather than actually saying “PDO” in the title of the product. I hope this makes sense. Enjoy, my friend, and thanks for stopping by to comment! I did look all over the pkg of prosciutto for the PDO stamp, but no luck – tried several grocery stores. We don’t have any specialty stores here. I do miss that about Schenectady – there are still a few italian bakeries/stores around. Perreca’s I believe being the oldest – have you been there ? Also – do you saute your prosciutto before putting on Sammie or just put it on cold ? I have indeed been to Perreca’s…they make excellent bread there! I like making my own Italian bread, but in a pinch I try to swing by and get their version. I could eat that entire loaf! Oh, and I just put the prosciutto on the sandwich cold (or at room temperature). I bet it would be delicious sauteed, though!